I found a kindred spirit and a perfect recipe. I found an Italian relative I had never met and she gave me her cavallo di batiglia, her prize dessert. It has only four ingredients. I wrote it down quickly, thinking it was missing something – gelatin maybe? – that I was missing something in my rusty Italian. A pot of cream, like this. Double cream, not single. No no, not 500ml, that’s too much. Rosemary, this much. Sugar? Yes, you boil it with the cream and rosemary. For three minutes! No more! Just three. Then you add lemon juice, I don’t know, as much as you need. Quanto basta. Little pots, like this, it’s very rich. Then in the fridge for half a day, that’s it. It was a revelation, magical in its simplicity. Once boiled, the cream thickens immediately upon adding few drops of lemon juice. It looks like lemon curd, or thick custard. 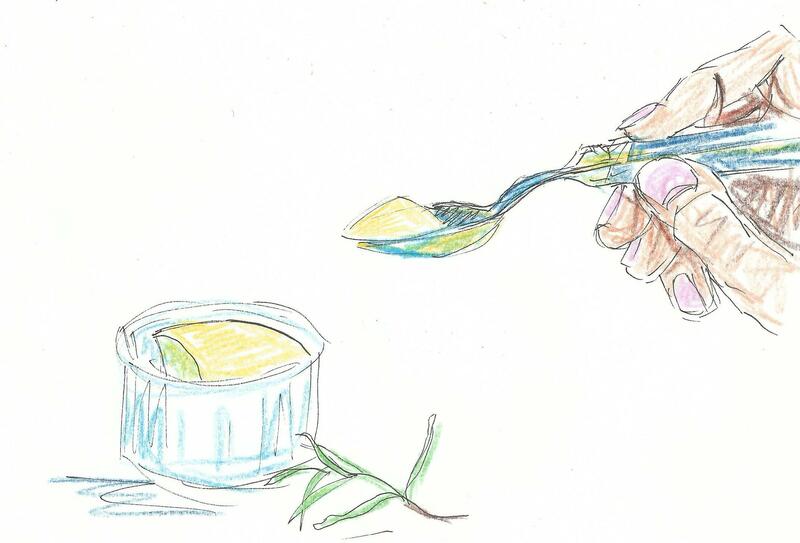 Add a drop more, taste carefully to make sure the lemon does not overpower the key ingredient, the rosemary. Left in the fridge overnight, it becomes an unctuous smooth dessert, a pot de crème. Reminiscent of white chocolate in its richness, cut through with the floral, woodsy rosemary, two spoonfuls are enough to set you dreaming. They are very rich, best served in tiny ramekins or plain espresso cups. Decorate with a sprig of rosemary and serve with a bowl of ripe plums or grapes, delicate plain biscuits if you must. No dark chocolate, no coulis or drizzles of this or that. Really, you should just concentrate on the intense rosemary. I found a perfect recipe and I cannot do it justice in words, it really is that good. I found family I hadn’t met before and she gave me this, rosemary for remembrance. This might very well be delicious with mint, lemon verbena or basil – but I haven’t yet tried, I loved the rosemary so much. Double cream is important for the texture – if you can only get single cream, you could try replacing 75g with mascarpone to up the fat content. 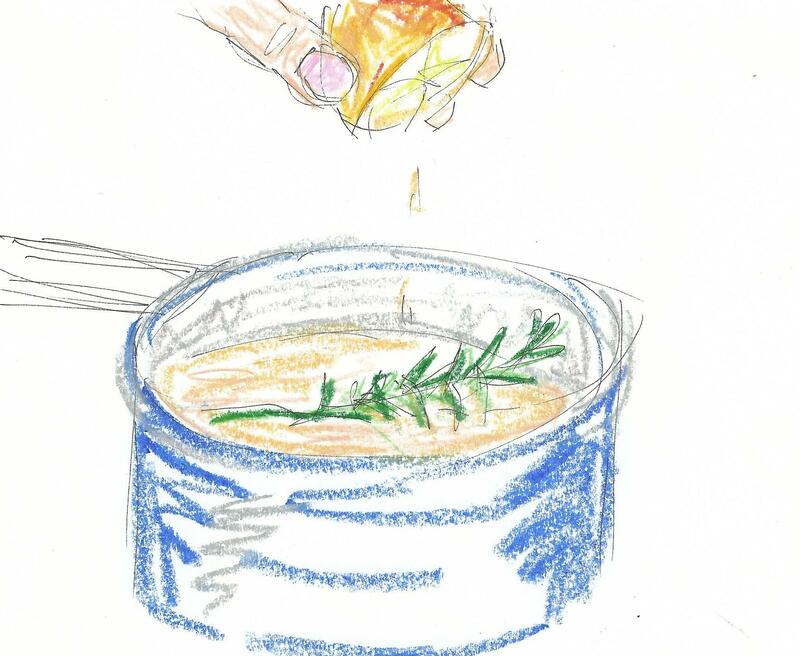 In a small saucepan, bring to the boil the cream, sugar and rosemary. Let it bubble fiercely for exactly three minutes without boiling over. Remove the rosemary, and beat in a few drops of lemon juice. Keep adding lemon drop by drop, tasting as you go. Stop when the cream thickens like lemon curd but before it tastes too lemony – the predominant flavour should be the rosemary. Pour into six or seven small dishes, espresso cups or ramekins. Cover with clingfilm and refrigerate for an afternoon or overnight. Serve with fruit or delicate plain biscuits.